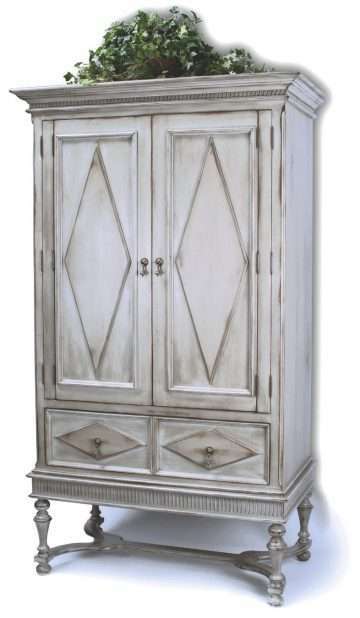 Intended for use with clothing, this unit features wrap-around doors, hidden storage with a beadboard interior back and 2 adjustable shelves; and 1 faux-front drawer with metal/nylon drawer glides. If using for a TV, you must request that the unit be drilled for component wires. TV would sit 31 H from floor. Ships in 3 corrugated cartons: Cabinet top (213 lbs), cabinet base (48 lbs) and adjustable shelves (30 lbs) on 1 wooden pallet (50 lbs).